Sky and Rico are expecting puppies! SKY (Jenner’s Prairie Sky) and RICO (HRCH Duckdawg’s Lethal Ricochet) are expecting their next litter this spring! Both mom and dad are EIC and CNM Clear, CERF, and OFA Excellent. As you can see, it is a wonderful pedigree, filled with excellence in working dogs! Sky is the daughter of Trevor (HRD Certified Area, Disaster, and Water) and Rosie (Live Certified in Area and Disaster). Sky is certified in Area Search and is SUSAR Type I Disaster Certified. 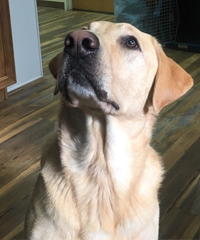 She descends from a long line of FEMA certified and area certified search and rescue dogs, and her littermates have accomplished much in their short lives! Sky is incredibly agile and fast, and has remarkable focus and attention. She has total eye contact waiting for your command, and then launches to the task. She is a JOY to work with, as she is so eager to please and so quick to learn new skills. Sky is 50 pounds and works with the intelligence, speed and ranging ability of her mom Rosie and grandmother Torie (FEMA Type I, AREA, SHR, CGC) — and she has the intensity and focus of her dad Trevor and grandfather Jenner (FEMA Type I, Area, SHR, CGC, Ranger Service Dog). Several of her littermates are already SAR certified with FEMA, NAPWDA, and NASAR, and others are titled in agility and dock diving. Rico is a remarkable young dog, and I chose him as a partner for Sky because he is bold, naturally athletic, and has a wonderful “whatever you want” attitude. 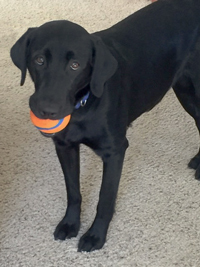 As his owner Libby Milroy (Duckdawg Retrievers) says, “He is incredibly intelligent with a high desire to learn. We can’t train him as fast as he can learn. He has tremendous drive and desire to please. He has a strong work ethic and a ton of ‘bottom,’ which means that he bounces back from failure or correction in a flash. He doesn’t get his feelings hurt and doesn’t get frustrated. I think his most amazing attribute is his cat-like athleticism.” Rico is 62 pounds. Rico is an accomplished hunting retriever, and has earned his HRCH. 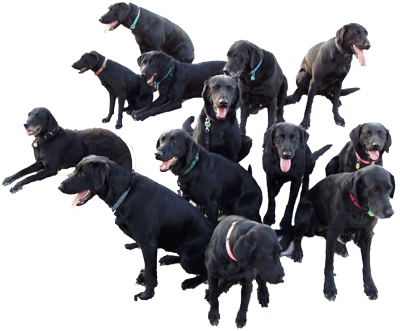 This should be a wonderful litter of athletic, willing, and intelligent pups ready to do search and rescue, hunting retrieving, agility, dock diving, etc. They are bred to be remarkable, loving partners in any venture you choose. Puppies are priced at $1,250 at eight weeks ($250 deposit requested).